In addition to fostering imaginative and symbolic thinking, enhancing motor skills, and providing an opportunity to manage sensory issues, art activities support a full range of social emotional benefits particularly as they build self esteem. And what better way to build self esteem than “framing” a child’s work of art! 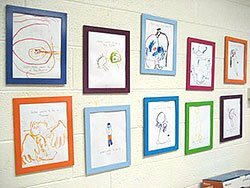 Inexpensive photo frames make a colorful Wall Gallery and allow you to easily change out artwork. These were purchased from Ikea for six dollars each, but Target, the 99cents store, and other value oriented retailers carry similar bargains. Make the project even better by decorating your own frames using simple and affordable beads, pipe cleaners and lace. It's important to display artwork tastefully to show off its value. Mounting or framing the simplest artwork brings out its aesthetic appeal. You may even know a woodworker or retired hobbyist who could handcraft simple wooden frames for your Gallery Wall. Don't forget when you display art to make sure everyone’s artwork is included.